Natural Living: What is it and why should you care? For those of on this path of natural living, we all have a story of how we got here. It is not of the norm to automatically care about toxins, the ingredients in foods, and chemicals in cleaning agents, for example, and how those things affect our health… Unless you were raised by parents who were passionate about those things and taught you there importance, you probably, like myself, had to learn the hard way. It usually takes a health scare, a health concern, or another major event in your life (like having a baby) to start educating your self on what truly causes illness. In most cases, illnesses don’t just randomly happen to people, there is usually always a root cause. First of all, you must find your ‘why?’ Why would it be important for you? It starts with answering that question. Would it be to get off of blood pressure medication? For the health of my family? To take control of my blood sugar? TO GET OFF MEDICATION ONCE AND FOR ALL? What is your why? Have the desire and start educating your self with toxins. They affect all people differently. Once you get on this path, it can be exciting and overwhelming all at once! It is easy to want to just throw out everything at once, but that can be expensive and overwhelming. Choose one thing to focus on first. For most people, it is food. So maybe choose to go through your pantry one day and throw out all foods containing artificial ingredients or begin by adding more raw and whole foods and slowly phase out the processed foods once you become accustomed to eating a natural diet. I have posted about this before; one of the major keys to health is reading the ingredients (not just labels) of EVERYTHING! Become savvy with chemical names that are hazardous to your health. Go through your refrigerator, pantry, cleaning supplies, and cosmetics (not all at once because that would be overwhelming!). Slowly begin making homemade cleaning products, and phasing out the chemical ones, buying natural make-up and soaps, etc. No, I’m not going to tell you to go take a class, but do your research! As a former teacher, one thing that was ingrained in my head was being “a life long learner.” I definitely do not claim to know it all, but I am passionate about learning. New research happens all the time, especially with health. Read up on Chemicals in the environment, chemicals in water and air, Toxins, chemicals in our food, chemicals in our cosmetics. Pick a few natural living blogs, like mine (!!) and subscribe! So that is it! These are the steps to living a more natural life. I know it can be over whelming, but this is your journey! It took me a long time to get to the point that I am, but never once have I regretted it and I know you won’t either! 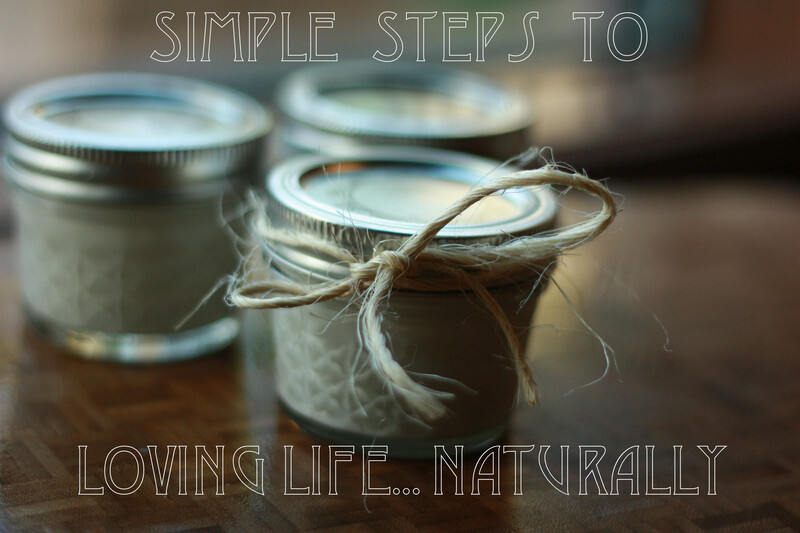 Do you have any additional beginning natural living tips to add for our readers? Please share, we would love to hear from you! Wonderful post! #2 is a crucial step. Trying to focus on everything makes you get lost, but picking one or a few things is the way to go with everything.